The fearless ladies of Women on Adventures (WoA) had another successful day of pushing limits and overcoming fears. 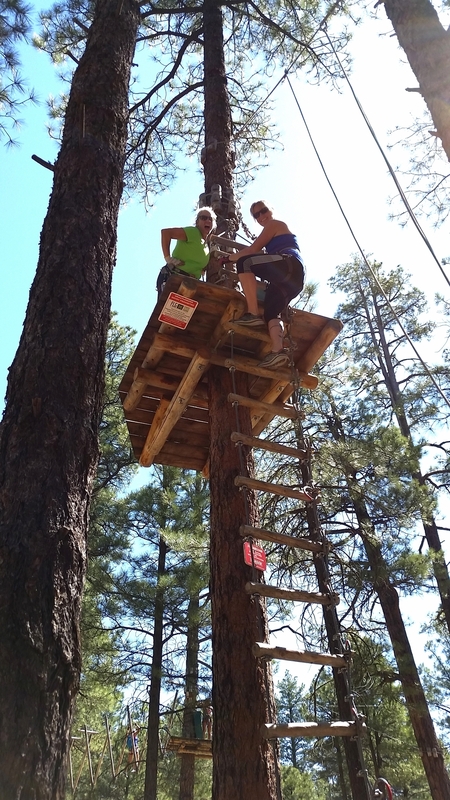 This time, we took a break from the Phoenix heat to tackle Flagstaff Extreme—a treetop obstacle course suspended 15 to 60 feet off the ground of Fort Tuthill County Park in Flagstaff, Arizona. I don't think I've ever used my upper body so much in my life, but the pain was definitely worth a day of swinging from ropes and zip lining through the pines of northern Arizona. We started our adventure with a short demo about safety and what to expect on the course, which has five levels (green, silver, blue, red, and black) in addition to a kid's course. The intensity increased as you progressed through the levels and no two obstacles were alike. We balanced on swaying logs, swung Tarzan-style into cargo nets, and even rode a skateboard 50 feet off the ground. The best part about this adventure was that there was no competition. We were all in it to challenge ourselves and have a good time doing so, which is what WoA is all about. It was inspiring to see what physically and/or mentally challenged each person most and to watch them overcome that obstacle (literally). I have to give props to the women afraid of heights who tackled this course—that took some grit. Personally, I struggled with the sheer strength needed to complete some of the obstacles. And I was surprised by how much strategy the course required. You really had to think about and plan how you're going to make it through before you begin. I am proud to say there were several of us WoA members who completed the entire Flagstaff Extreme adventure course. The appropriately named Black level was the most physically exerting part of the entire course, but we were rewarded with the most satisfying sense of accomplishment. We also got to grab one of the black silicone Flagstaff Extreme bracelets hanging from the final ladder on our way down...it's the little things. Everyone who came made it through the red course, which was an achievement in itself—the kind that called for celebration. So, we went to Diablo Burger in Flagstaff, where got a beer and one of the best burgers in Arizona. They also had fresh-cut Belgian-style fries, which paired deliciously with their house-made curry ketchup. It was the perfect meal to induce the food coma that many of us needed, especially since we were taking on Humphrey's Peak the next day. We were tempted to call it off and spend the day relaxing from Flagstaff Extreme but...when in Rome, right?